The following post is by Santa Monica Mayor Ted Winterer from the city of Santa Monica website. 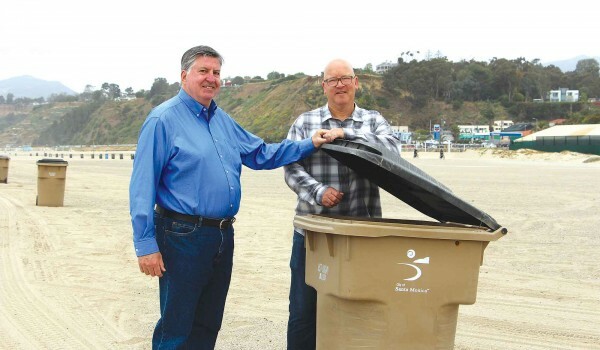 Santa Monica City Councilmember Kevin McKeown (left) and Mayor Ted Winterer (right) clean up the beach. Photo via city of Santa Monica. As we start dusting off the beach chairs, firing up the BBQ, and getting into the mindset of warm days spent at the beach, I want to challenge our residents and everyone visiting Santa Monica to help us make it a trash-free summer at the beach. Santa Monica’s motto is “A fortunate people in a fortunate place.” As the keepers of one of the most naturally beautiful coastlines in the world, we are very, very fortunate. Our beaches are second to none, but over the last several years there has been a noticeable increase in the amount of trash on the beach and at the water’s edge. The City of Santa Monica has a dedicated beach maintenance team that uses specialized equipment and handpicking to keep the beaches clean every day. If you walk or run the beach in the early morning hours, you’ve likely seen our team at work. We know that everyone wants to keep the ocean clean, to protect wildlife, and to experience the sand without garbage. We all value a clean beach, which is why I challenge you to do your part. It’s simple: pack it in, pack it out. Throw away or take everything you bring out with you. Even small things like straws and bottle caps are really bad for the beach ecosystem and they are the most common items left behind. Bring a trash bag: Challenge your family to fill a trash bag when you come to the beach with your own used items and other pieces you find on the white sands. Be a volunteer or form your own clean beach day: Learn about upcoming organized events with Heal the Bayand Surfrider Foundation, or organize your own event. Talk to your kids about beach trash: There are no better champions than children. Talk to your kids about how we protect the environment through responsible recycling. The beach belongs to all of us. Let’s be good stewards together. From my family to yours, have a great summer!